From the best shutter style to getting the material right, we’ve installed many a bathroom shutter in our time. Our expertise will help you get your bathroom shutters just right. Windows are a central feature of any room but are too often overlooked in favour of other areas when embarking on a redesign or renovation project. Just like windows, bathrooms can be low on the priority list when it comes to decorating. However, bathrooms are not only one of the most important rooms people judge when potentially buying a property, but also, the bathroom is a room which should be a haven in the chaotic family home: a place where you can enjoy a relaxing bath with a glass of wine and escape the stresses of everyday life. Shutters are a fantastic addition to any home and the bathroom is certainly no exception. Easy to clean and less vulnerable to damp than other window dressings, shutters are both a practical and aesthetic addition to any bathroom design. Before you start to make any significant changes to your bathroom, or any other room of your home for that matter, it’s beneficial to have an idea of what type of environment you want to create. If you have young children then your bathroom is likely a place of shower time toys. Bathroom shutters let in an abundance of light for those busy bathtimes. You may also be thinking of easy maintenance materials, easy to clean tiles, anti-warp shutters, or moisture resistant bathroom vanity units. Then there’s those who are setting up home with a partner. Perhaps your priorities are to make the bathroom a romantic, spa-like, luxurious space. Well, shutters for the bathroom offer something for everyone. In fact, we’d go as far as to say they are the perfect bathroom window dressing. While you may be starting with a bathroom that lacks a strong sense of design, your property might dictate what type of shutter works best in your bathroom. Period properties with original features will suit solid shutters to evoke images of a French chateau. Café style shutters or full height shutters with hidden rods have clean lines and will work better in contemporary bathrooms – though this is also dependant on your choice of decoration. While you don’t have to decide on the specifics just yet, having a mental image of the broad style of characteristics you would like to encapsulate is a useful place to start when choosing bathroom shutters. When considering the different shutter styles, bathrooms are quite different from most other rooms in the house. Privacy will be a prime consideration when choosing shutters for your bathroom. Café style shutters are an excellent choice for the bathroom, they’ll keep the lower part of your window concealed while letting light flood in over the top. With this style of shutter, you can maximise the light in your bathroom without sacrificing the natural light. However, it is possible that due to the location of your property you will need to a shutter which covers the entire window – particularly if your house or flat is overlooked by a taller building, tier-on-tier shutters are an excellent solution in this case. The bottom and tops of tier-on-tier shutters open independently of each other giving you the ability totally close off your window when necessary while maintaining natural light at other times. Full height shutters are actually preferable to café shutters if you have a small window and/or a small bathroom as their full length elongates the room and makes it appear larger. Solid shutters are best avoided in bathrooms as they prevent ventilation and light and are best reserved for living rooms or bedrooms. 3. Which material should you choose for bathroom shutters? Unlike other rooms in your house, choosing the right material is more than just an aesthetic choice when it comes bathroom shutters. 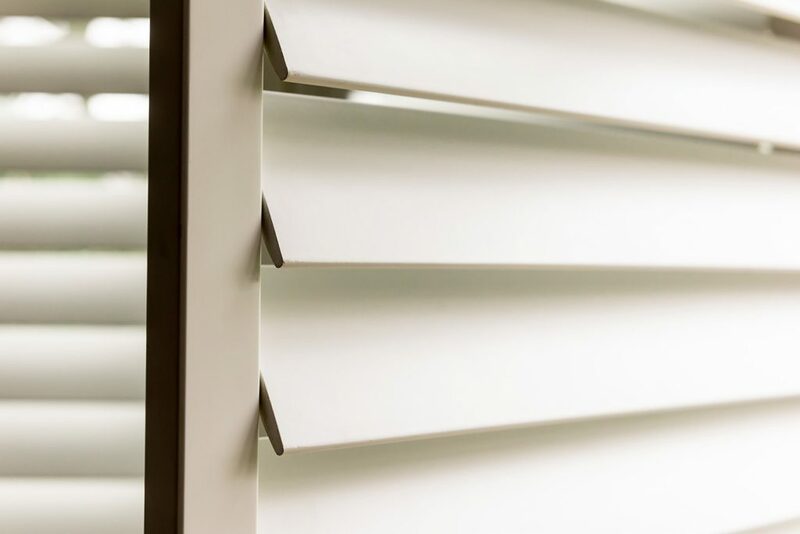 If your bathroom is prone to humidity then waterproof shutters is advisable – even when in contact directly with water, waterproof polyvinyl shutters will not warp or split over time. If you don’t have humidity and steam concerns then wooden shutters are perfectly fine. How shutters open and close is going to be of particular importance in your bathroom to ensure that you have enough ventilation while still maintaining your privacy. Our shutter experts will help with this when they attend an initial appointment in your home. Shutters which can be opened by tilting the slats, rather than drawing the entire shutter is back, are generally preferable for bathrooms. This way, you can open the windows and shutters for post-shower ventilation while still retaining privacy in the room. While opting for a coloured shutter can be a risky strategy in another room, in a bathroom, it’s less of a risk, and a great space to experiment with colour. While kitchens, living rooms and bedrooms are spaces you spend more time, the bathroom is in use less than other rooms of the house, benefiting from an injection of colour without the fear that you will grow to dislike it. Shutterly Fabulous offer various paints and stains to choose from, as well as a colour match service in almost any colour of the rainbow. Visit our coloured shutters page for the full spectrum. 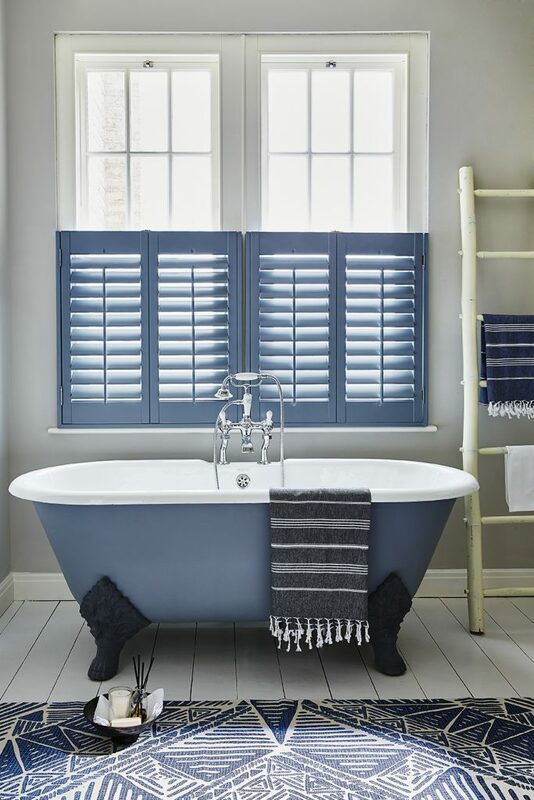 With most bathrooms being decorated in neutral tones and bathroom suites predominantly white, your shutters can lead the way in the colour scheme of your bathroom. Choices will depend on personal preferences but blues, browns and yellows are firm design favourites guaranteed to reinvigorate even the blandest of bathrooms. It is possible to install bathroom shutters yourself, but why risk measuring incorrectly or fitting them wrong when our shutter specialists can design, measure and install stunning bespoke shutters on any window in your home saving you the trouble. With decades of experience under our belts, book an appointment with Shutterly Fabulous to discuss your bathroom shutters and leave the hard work to us. To see some fabulous examples and for more information about bathroom shutters, visit our Bathroom Shutters page or contact us.